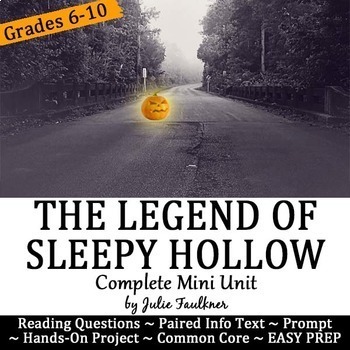 This low prep unit for Washington Irving's "The Legend of Sleepy Hollow" is the perfect standards-based resource just in time for Halloween. Your middle and high school students explore the legend through a careful process of close reading and thought-provoking activities while taking note of the author's expert narrative techniques. Student Experience: Students will read the short story and follow along with a set of questions. The reading will conclude with an interactive plot chart review activity. Next, students will analyze an informational text article and make connections. After a quick study of characterization, students will design a character collage and finish the unit with a constructed response. ♥ "Love this story and the addition of a short informational text with it. Thank you for a great product." ♥ "This legend a high interest topic at Halloween. It is a great way to stay rigorous as well. :)"
♥ "Students especially enjoyed the character collage. Thank you." ♥ "THIS LESSON IS WONDERFUL! I am using it this week to get us into the Halloween spirit." 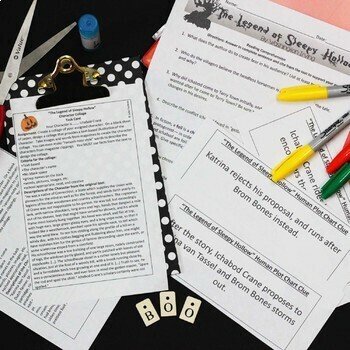 More “spooktacular" Halloween resources are just a click away! Info Text Lesson: Are Horror Movies Horrible or Hilarious?